In the quaintest application of Dibond aluminum composite material, Noir Vif a design studio out of Paris, France, submitted several new prototypes made of ACM for an old tradition. Paris has a unique custom going back to the 16th century of booksellers selling along the banks of the Seine river. They are known as the bouquinistes and their second-hand collections are sold out of green boxes. The used booksellers started their street peddling in the 16th century. Traditional booksellers pressured authorities to shut them down and authorities gladly obliged in preventing parallel markets under little censorship. Fortunately, the prohibition eventually faded; paving the way for a revered tradition in the romantic city. 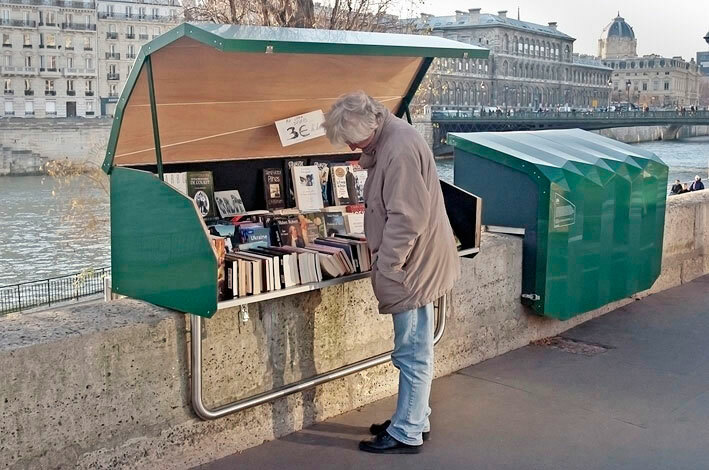 Other cities such as Beijing and Tokyo eventually tagged along to create their own used booksellers along their streets. Over hundreds of years, a few things evolved: They were given an emblem of a “lizard looking at a sword,” the bouquinistes were permitted to be established at fixed points on either side of the river, each bookseller was allowed 32 feet of railing for a minimum annual fee. Also, the booksellers were given operational times between sunrise and sunset. Then, finally in 1930 the dimensions of the “boxes” were fixed. Today, a length of nearly two miles along the Seine is declared a UNESCO World Heritage site. An estimated 240 bouquinistes utilize 900 “green boxes” and house upwards of 300,000 used books, stamps and trading cards. 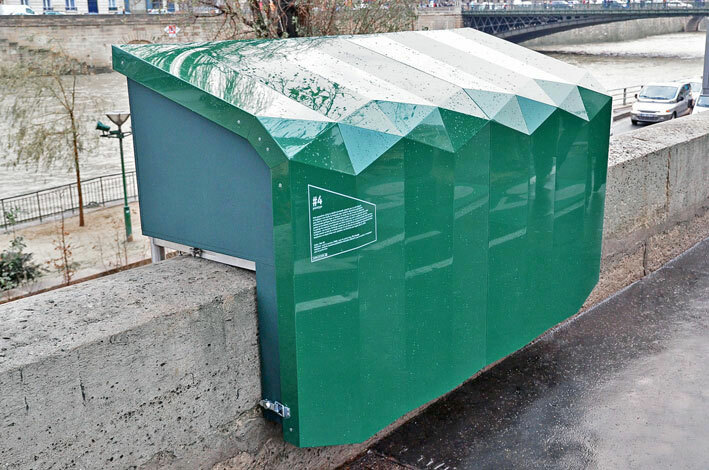 The design studio, Noir Vif, translated to “see bright” in English, was given the question, “If designed today, what would the boxes of the bouquinistes installed along the Seine look like?” The challenge was to come up with a solution that addresses materials, style, and ergonomics, while keeping in line with regulatory requirements. Their answer came in three prototypes in the traditional green hue and folded into a box that can either straddle the concrete parameter of the river or stand alone. “We chose Dibond because it was the best material answer we could find for this project,” claims Guillaume Lehoux, one of the industrial designers at Noir Vif. The Noir Vif designed prototypes, each about eight feet long, sit on stainless steel frames designed to fit the parapet. Forest green Dibond was folded into a shelf for used books, complete with a door flap and latch for a lock. Dibond is incredibly weather resistant, malleable for folding, and appropriate for long-term outdoor applications. Situated in a damp, rainy climate, the material needed to hold up to rain and wind without showing wear, and be folded to create the protective lid. Since Dibond is especially dependable, uniform, and durable – it is used in housing cladding too – it was chosen for two of the prototypes. “Dibond panels were surprisingly easy to manipulate and process and the results were beyond our expectations,” said Lehoux. 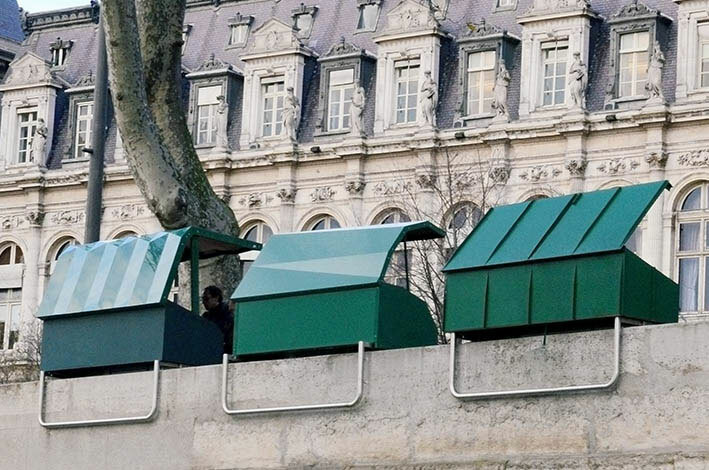 The Noir Vif designed prototypes will be on display along the Seine as part of the initiative from the Matériaupôle Paris Seine Amont Association.